Isn’t it great, that feeling when you get up on a bike in the morning to get to work, or when you are looking forward to your regular outdoors workout? And what about now, when it can get a bit snowy outside? Popularity and general interest of cycling naturally decrease during the winter months but no matter what opinion polls say, I say yes to cycling in the snow and I ride snow on my fixed gear bike. I am sure I’m not alone. Although sometimes I get pointed at, I still see other cyclists out on the road in the blaze, some on fixed gear bikes and the thought of me not being completely insane by myself sort of comforts me, but is it so? I am sure many of you have the same urge for sliding the roads on two wheels while freezing some sensitive areas to the brink of frostbites, or at least you don’t care enough to change your joy of daily commute to anything else but cycling. 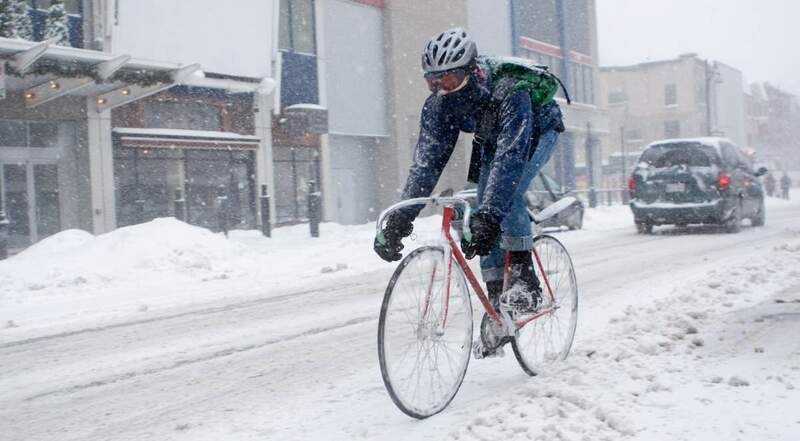 Actually, if we look at some facts, winter cycling is not such rare commodity as it may seem. There are many towns in Sweden where cycling is the preferred mode of transport even in the snowiest of winter months. Just check the #vikingbiking hashtag on Instagram and it will all be quite clear. Denmark follows in the footsteps of Sweden. Although Danes are more famous for cycling culture, the country gets snowy on fewer occasions than Sweden but nevertheless, their cyclists are as passionate. Anyone who’s been out on a snowy day will know you need to make some preparations before you meet a slippery road head on. If you haven’t had a chance to drive in the snow this famous youtube video from Montreal will give you a decent insight into what are you about to expect. Surely, one of the first points of preparation is to dress warm, but that’s too obvious to remind here, however, I have noticed my gentleman’s area suffers a lot on frosty days so be it a winter cycling gear or a pair of jeans, my advice would be to wear padded cycling shorts underneath. Just to give an extra layer for those important bits to be in a good shape. Also, just like when walking, you probably choose a pair of winter shoes, you should probably also think of a pair of grippy set of tires to get more traction. There is not much you can fight against black ice but grippy tires will be a great help on any form of snow. There are also dedicated winter tires available out there, some are even studded to give more grip on ice, but I find those rather slippery on wet tarmac rendering a hazard in more usual conditions. When using your loved bike in winter conditions, be it ice, snow, rain, or all three, your bicycle is experiencing much higher exposure to weather conditions. Most countries where icy roads are common, fight the deed with either snow, sand or a combination of both to reduce the ice and make the road less slippery. Both salt and sand are not very good company for your bike. In fact, it’s probably one of the most harmful conditions you can put your bike under. Salt has extremely corrosive properties and it tends to get in between of moving parts and start corrosion. Sand, on the other hand, is good at promoting wear and tear. The combination is a nightmare to all moving parts. Most bikes with gears have derailleurs with small spinning sprockets that easily get clogged and damaged, gear cables which often get stiff or stop working in winter conditions, shifters which you probably don’t want to wear out and this is where the magic of fixed gear comes in. All single speed bikes, including fixed gear, have an absolute minimum of moving parts possible. Fixed gear bike, in fact, is the winner in this competition. It’s one chain, two sprockets, a pair of pedals and a handlebar. Of course, you still need two working brakes, but that’s a lot of money and energy savings on maintenance. All you need to worry about is to keep your chain well oiled and keep your eyes wide open. Fixed gear bikes are famous for their absolute minimums of maintenance needed. Most probably it is one of the main reasons they did become so popular with New York bike couriers in the 80s and 90s. A fixed gear bike is a simplicity itself on two wheels, but that’s only one side of the argument there. All single speed bikes, including fixed gear, have an absolute minimum of moving parts possible, which helps a lot of money and energy savings on maintenance during the harsh winters. How does one break with fixed gear bike in the winter? Many may have a small experience on a fixed gear bike and they know stopping the thing could be harder than getting an exorcism done by a heavy metal band. But there is a trick up the sleeve. Remember that video from Montreal earlier? Those of you who have been driving on slippery roads might know a thing or two about engine braking. In vehicles, engine braking is done by slowing the motor vehicle down with an engine by downshifting gears, rather than using an external braking mechanism such as disc brakes. This is very beneficial where more control over the vehicle is needed, like when going on a steep downhill or on a slippery road. Braking with an engine reduces the speed without a potential to locking the wheels giving a lot more traction and there forward more control. How is it related to fixed gear bikes you ask? A fixed gear bike is the only bike you can stop without any brakes and when cycling in the winter, this can be very beneficial. You stop the bike simply by slowing down the pedals. It translates exactly to the same physics of engine braking giving the rider a lot more control over the bicycle, friction and the grip. This is the other strong point of a fixed gear bike in the winter. It is simply safer to ride it in slippery conditions. Why don’t so many people do that? I am not sure. It does take a hang of it to start riding a fixed gear bike and the things are not as popular in general. Some people still count fixies as an unnecessary trend but there are a lot of people who love riding simple and efficient bikes and as it turns out, fixed gear bikes can actually be very useful, practical and safe bikes to ride. They are not for everyone, but they are definitely exciting to ride. Maris Skujins is a husband, a hobby chef and a founder of Single Speed Co., the ultimate online store for single speed and fixed gear bikes.